The new Raley's store opened on Sunday after a whirlwind conversion from Scolari's. Lisa and I went over there today to see what changed and what didn't. The new signage that was going in as we left on Scolari's Closing Day is up. Lisa noticed right away that one of the displays was placed in such a way that it blocked a fire exit door. She notified the manager, and to their credit, they had that display moved by the time we left. Good for them! 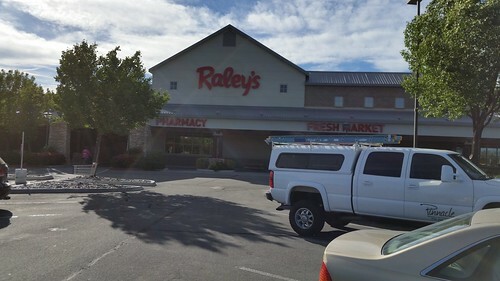 There are some things that Raley's carries that Scolari's did not, and we think this might reduce the number of grocery shopping trips we make to Reno/Sparks; however, we will probably still go to WinCo for bulk shopping. This is still a transition period for this store. Some of the old stock is on heavy clearance. We bought the final stock of some items that we may not be able to get anymore. We also bought some of those things that normally need a trip to Reno. On the whole, the initial report is positive.